Comfortable and relaxing, the Sole R92 recumbent bike gets you back in the exercise mode without breaking the bank. The console features Sole’s attractive integrated blue backlit LCD display for workout stats, with easy to use programming buttons right under the display. The exercise bike has 10 workout programs including hill, cardio, and strength, as well as 2 user defined workouts, and 2 Heart Rate Control workouts. 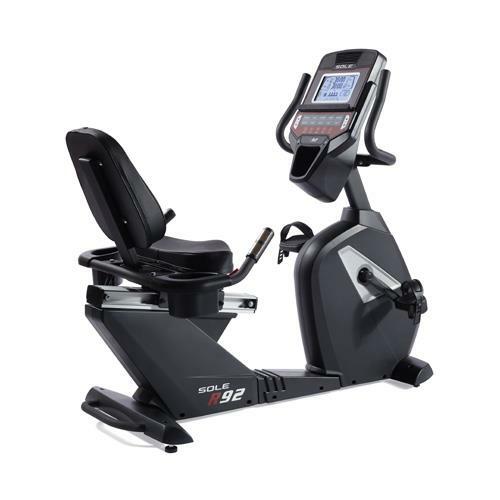 Check out the popular R92 Recumbent Bike at the Sole Store! The Sole R92 recumbent bike features a sturdy steel frame, a 26-lb flywheel, and up to 20 levels of resistance available to the 10 workout programs. It has a convenient step-through frame for easy mounting and dismounting, self-leveling pedals, a cooling fan, an MP3 player plug-in port, and built-in speakers. Recently introduced is Bluetooth technology, which allows users to track all of their workouts via the Sole Fitness app and other popular apps such as Apple Health and Fitbit. You can monitor your progress and see how close you are getting to your fitness goals. The lifetime frame warranty and long warranty on parts and labor are backed by Sole’s excellent reputation for attentive customer service. Reviewers consider Sole’s new recumbent model to be well built, offering low-impact exercise in style and comfort. It is a sturdy bike that can handle a maximum user weight up to 300 pounds, and includes such features as Sole’s patented 2-degree inward slant on the pedals to keep your body in a correct posture, and it features a large foam seat with back support for the lumbar region. The seat adjusts to 12 positions so you can be sure to find the best fit. With a small footprint of just 57-inches long, the Sole R92 model will fit into most spaces where you hope to fit an exercise machine. 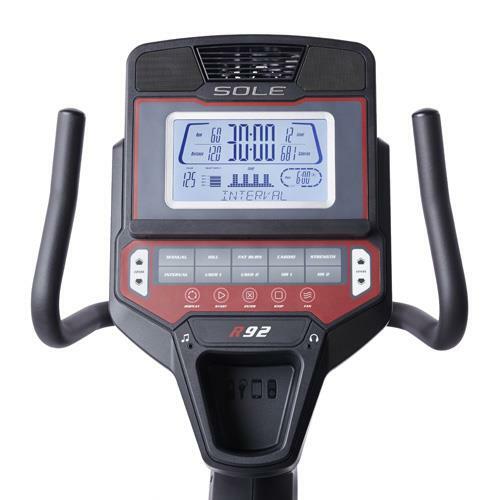 If you need something even smaller check out the entry level R72 model., although it does not offer Bluetooth synching like the R92 and top of the line Sole LCR recumbent exercise bike. Offered at $899 to $999 with free shipping, the good-looking Sole R92 recumbent is a solid choice with a club quality feel and smooth, natural pedaling. Sole has waited for years to bring out a line of exercise bikes and they’ve done a great job matching designs with quality components. But time will tell how well the Sole R92 recumbent bike sells in comparison to the popular Lifespan R3 Recumbent, which has set the bar high at this price point.